​Kids love learning about volcanoes - they will race through this Minute about Mt. St. Helens. Author Whiting started his Minute on this volcanic eruption with a story of a young family travelling some distance from the now infamous Mt. St. Helens. Ask your students how this connects to the story. Would this Minute be as effective if these stories of people who lost their lives had been omitted? What do humans do when the unanticipated happens? How do they react? Take a closer look at human behavior prior, during and following natural disasters. Look at micro (individual and family) and macro (community and government) reactions and consequences. Ask your students what we can learn from studying human behavior. What exactly causes a volcano to form? Erupt? Are there different types of volcanoes, and if so, what are they? Send your students to National Geographic Kids to learn the facts and watch some great videos to more thoroughly understand the science behind volcanoes. Try out the experiment from the Bill Nye video (use the fast forward button to skip through videos). Use this Minute to introduce or review plate tectonics. How do the Earth’s plates determine where we find volcanoes? What other physical features and landforms appear at the junctions of the Earth’s plates? How do we study tectonics? How can the study of tectonics help humans? The USGS mission statement says “The USGS serves the Nation by providing reliable scientific information to describe and understand the Earth; minimize loss of life and property from natural disasters; manage water, biological, energy, and mineral resources; and enhance and protect our quality of life.” Have your students search this valuable resource for more information about volcanoes. 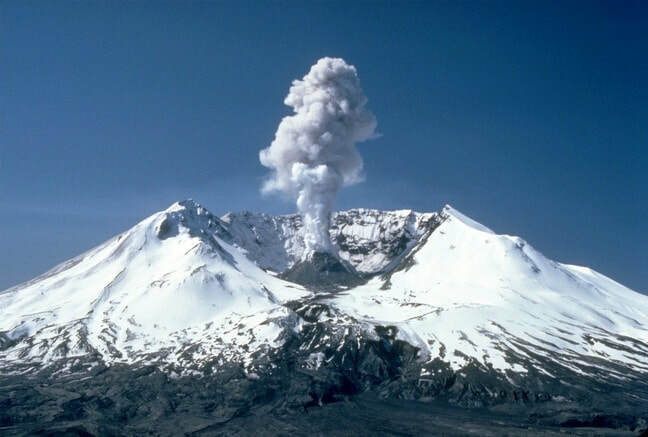 Critical thinking: while this resource provides loads of information, see if your students can discover what the limitations are when learning about volcanic activity only from the USGS.